The fast-growing English or Persian walnut tree can reach 60 feet with a 60 foot canopy by maturity. A tree of that size can produce a lot of nuts, as much as 6 bushels a year according to the University of Tennessee’s Agricultural Extension office. How does one tiny nut end up producing that many fruit? The fruit life cycle of the English walnut tree follows a predictable pattern. 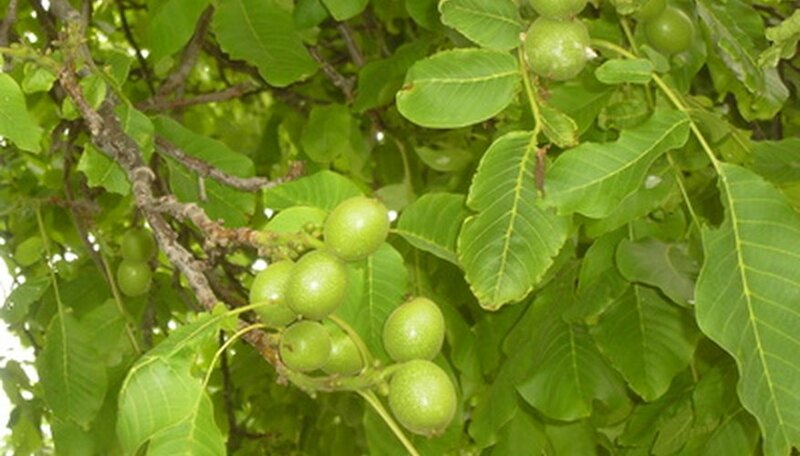 Most commercially sold English walnut trees are grafted trees. That is they are bound to another tree, usually a Black walnut tree to improve performance. However they can be grown from seed. The seed is the nutmeat. Once the shell has opened and the seed has germinated, the root and stem begin to emerge. Seedlings reach 4 to 5 feet in height the first year if environmental conditions are right. Trees continue growing, developing strong root systems that reach 6 feet down or more. The tree gains height and develops its structure that will one support the weight of all those English walnuts. Grafted trees will reach fruit production earlier than those grown from seed, between three and five years of age. Trees grown from seed will begin producing walnuts between the ages of four and eight years old. Early production will be significantly less than when trees reach maturity. Grafted trees reach maximum production at about 14 to 16 years old while seed-grown trees reach full production at 14 to 18 years old. Pollination is a tricky matter for English walnut trees. English walnuts are self-pollinating which means they can pollinate with the pollen from a tree of the same variety and do not need a different variety for pollination. Where the difficulty comes in is the bloom time of the male and female flowers. With English walnuts, often the male flowers drop their pollen before the female flowers have become receptive resulting in low fruit yields. Older trees tend to have more overlap in the bloom time but younger trees may need help from a pollinator that blooms in time with the female flowers in order to produce a substantial yield. Following pollination, the flowers will drop off and tiny green hulls will begin to appear. Throughout the summer, these hulls, which contain the shell and the nut inside, will continue to grow. Nuts are usually ripe by October. If the tree has received adequate moisture all year, the hulls will be somewhat thicker and will begin to split, dropping their fruits to the ground below. In dryer years, the hulls will be thinner and the nut may fall to the ground with the hull intact. Often commercial growers shake the trees to force the nuts to fall. Private growers customarily wait for the nuts to fall on their own. If they fall in the hulls, they should be allowed to lie for one to two weeks before gathering. This permits ample time for the hull to dry out making its removal easier. Nuts that fall without the hull intact should be gathered daily to prevent ground moisture from causing mold to grow. Nuts can be saved, stored outdoors or in the refrigerator to simulate winter. These can be planted the following year.